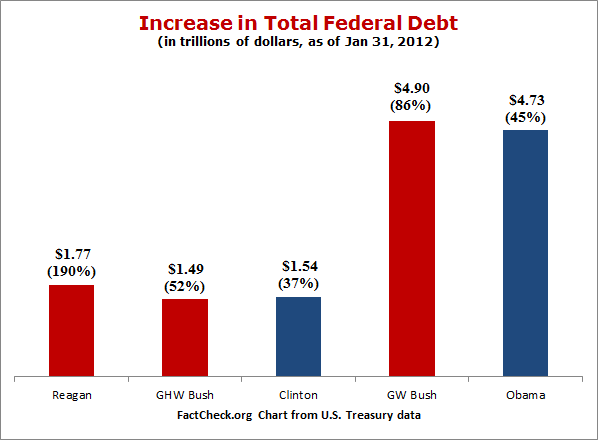 Q: How much has the federal debt gone up under Obama? A: During his first three years in office, it rose $4.7 trillion, an increase of 45 percent. Partisan graphics circulating via email and Facebook are both incorrect. Both sides are circulating deceptions about the federal debt, judging by the many queries we get from our readers. So we’ll try to set the record straight here. There’s no sugar-coating it, as some supporters of President Obama have tried to do. 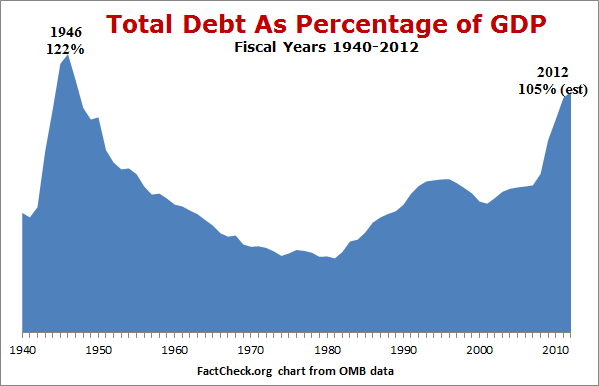 And the rapid rise in the debt is alarming enough without fabricating false statistics, as some Obama critics have done. It’s not true, for example, that the debt has increased only 16 percent since Obama took office. That erroneous calculation originally came from the office of House Democratic Leader Nancy Pelosi. And — despite being corrected later — it has continued to circulate via email. Even the corrected version, currently appearing on the site of the liberal group MoveOn.org and Pelosi’s Flickr site, is many months out of date as of this writing. It shows a 35 percent increase for Obama, which is now far too low. And it’s also untrue — as claimed in a graphic widely circulated by email and in social media postings — that the debt has increased more under Obama than under all previous 43 presidents combined. In fact, as of Jan. 31, 2012, the rise under Obama had yet to surpass the rise under his predecessor, George W. Bush. The figures in that graphic are pure fabrications, as anyone can easily confirm by plugging Obama’s inauguration date — Jan. 20, 2009 — in the Treasury Department’s handy “debt to the penny” website. That shows the nation’s total debt stood at $10.6 trillion on the day Obama took office (not $6.3 trillion), and it had increased to nearly $15.4 trillion by the end of January 2012 — a rise of more than $4.7 trillion in just over three years (not $6.5 trillion). That’s a huge increase to be sure — 44.5 percent. And the Congressional Budget Office now projects that it will grow to more than $16 trillion by the end of the current fiscal year on Sept. 30. At that point, the debt will have increased by more dollars in Obama’s first four years than it did in George W. Bush’s entire eight-year tenure, when it rose by $4.9 trillion. The rise under Obama would then be the biggest dollar increase for any president in U.S. history. Here is how the nation’s total debt has fared under the past several presidents, as of Jan. 31, 2012, in trillions of dollars. The percentage increases are given in parentheses. Our chart looks much different from Pelosi’s, because ours shows the actual dollar increase, not just the percentage change. As can be seen here, Obama’s 45 percent rise is nearly equal in dollar terms to his predecessor’s 85 percent increase — because Obama started from a much higher base. Similarly, had we based our chart on the rate of rise, it would show the debt rising much faster under Obama than it did under Bush, whose increase was spread over eight years. Other adjustments could be made to account for inflation. Indeed, one of the most meaningful ways to look at the debt is to measure it not just in raw dollars but in comparison with the economy — as a percentage of the gross domestic product. In this chart, which we generated from the most recent historical data and projections (Table 7.1) from the Office of Management and Budget, it can be seen that the total federal debt in relation to the economy is reaching historically high levels — approaching levels not seen since World War II. But it can also be seen that the rise started long before Obama took office. In fact, the upward trend began with Ronald Reagan’s fiscal 1982 budget, declined somewhat from fiscal 1997 through 2001, and resumed the upward climb with George W. Bush’s first budget in fiscal 2002 (which started Oct. 1, 2001). And the rise accelerated as the economy slid into the worst recession since the Great Depression, starting in December 2007. As the economy shrank, the debt-to-GDP ratio jumped 5 percentage points in the fiscal year that started Oct. 1, 2007, and another 14.8 percentage points during the following year. Obama took office nearly one-third of the way into that 12-month period. At the time, the nonpartisan Congressional Budget Office was projecting the deficit for that fiscal year would be $1.2 trillion. It later rose to $1.4 trillion after enactment of Obama’s economic stimulus package, to be followed by back-to-back deficits of nearly $1.3 trillion in fiscal 2010 and $1.3 trillion again in fiscal 2011. CBO just projected the deficit for the current fiscal year, ending Sept. 30, will be $1.1 trillion. A caution: The chart we’ve shown here is for total debt, including money the government owes to itself, chiefly through the Social Security trust funds. But a chart tracking only the debt owed to the public would show a similar shape. CBO projects that the debt owed to the public was nearly 68 percent of GDP in the fiscal year that ended Sept. 30, and will reach 73 percent this year and exceed 75 percent at the end of fiscal 2013. All we can do here is point to the correct figures for how much debt has piled up on Obama’s watch, and note that there is ample blame to go around. When the partisan deceptions on each side are disregarded, the plain fact remains that the debt has increased, for many years, under both Democratic and Republican presidents. And it is currently increasing rapidly, reaching historically high levels, while partisans continue to struggle over what to do about it. U.S. Treasury. “The Debt to the Penny and Who Holds It.” Online database. Accessed 2 Feb 2012. Congressional Budget Office. “The Budget and Economic Outlook: Fiscal Years 2012 to 2022.” 31 Jan 2012. Office of Management and Budget. “Historical Tables: Table 7.1—Federal Debt at the End of Year: 1940–2016.” 14 Feb 2011. National Bureau of Economic Research. “US Business Cycle Expansions and Contractions.” 20 Sep 2010. Congressional Budget Office. “The Budget and Economic Outlook: Fiscal Years 2009 to 2019.” 8 Jan 2009. Klein, Ezra. “Doing the math on Obama’s deficits.” Washington Post. 2 Feb. 2012. Pianin, Eric. “Super Flaw: “If Only Obama Had Upheld Bowles-Simpson.” Fiscal Times. 22 Nov 2011. Dorning, Mike. “Obama Agrees to Extend Bush Tax Cuts for 2 Years.” Bloomberg News. 6 Dec 2010. The National Commission on Fiscal Responsibility and Reform. “The Moment of Truth,” final report. Dec 2010.